Canegata Ballpark in Christensted came alive with music and dancing Saturday. It was a celebration of when two cultures merged to one. “When Puerto Rico came to the Virgin Islands in 1964 everything just came together instead of being like just Cruzan food, it was Crucian and Puerto Rican food just mixed together,” Rosa-Leea Clarke, Miss Virgin Islands Puerto Rican Friendship Queen 2018-2019 said. Rosa-Leea Clarke was named this years Miss Virgin Islands Puerto Rican Friendship Queen. Her family has roots on both islands and said it’s not about what makes the two places different it’s about how much they have in common. That was the message of the day, as families from all different backgrounds and traditions came together to celebrate the day of friendship. Part of Saturday’s mission was to get the kids involved in the annual event. “Imparting the culture to the young children and I really love it, I know it’s not a wonderful day it’s been raining, however we are still here, having something for the children,” Mirza Saldana-Lampe, Chairperson of Family Fun Day said. Rain didn’t stop kids from enjoying face painting, dancing, or the youth bands from coming out to play. 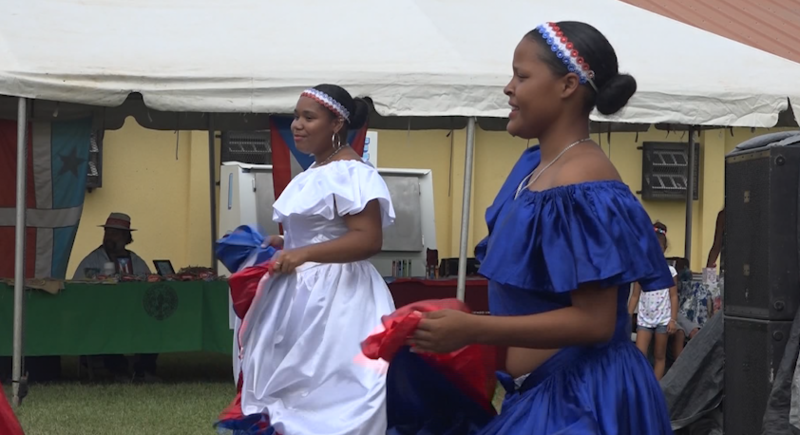 Organizers said it’s all about getting people involved and learning about the rich tradition between the two islands and continue the celebration for many years to come. “It is such a strong unity that we don’t want that bond to be broken after 54 years of pulling it together,” Troy Millington, Vice President VI PR Friendship Committee said. The weekend might have wrapped up on Sunday but the bond will continue for a long time to come.